Dairy commodity price tends to be volatile with prospect to surge. This feature entails the necessity of obtaining the quantitative relationship to forecast the consequences following price change. Elasticity is employed to quantify the responsiveness between price and supply/demand. The dairy industry is inelastic in general, but elastic for some substitutable products, e.g. whole milk. Under volatile price fluctuations, information on elasticity, supply curve and demand curve of the segmented market of interest is more relevant than that of the overall dairy industry. Supply curve is upward sloping and elastic. The changes in production resulting from price fluctuations can be estimated based on the supply curve. Demand curve is downward sloping and inelastic. The changes in sales resulting from price fluctuations can be estimated based on the supply curve. Given the growing need in markets like China and India, high quality dairy commodities will be the future direction for investment. The dairy sector is emerging in China, but how it is linked with the rest of the economy is not well studied . For the past eight decades, the dairy price has been closely tracking the overall price level, as shown in Figure 1. It suggests that the dairy industry is pro-cyclical with the whole economy. Moreover, there are two subtle qualitative features that can be drawn from the historical path. Figure 1: CPI V.S. dairy commodity price index. On the one hand, it is apparent that dairy commodity price is more volatile compared to CPI, noticed also in Rabobank’s Global Dairy Outlook . The higher fluctuations can be explained by its sensitivity to various idiosyncratic risks, such as weather, fuel price, etc. Fundamentally, the price is determined by the supply and demand in market, which will be explored quantitatively in the next section. On the other hand, the dairy commodity price grows constantly faster than the overall price level before 1985, while falls below in recent three decades. This interesting feature seems to indicate a suppressed growth in dairy commodity price. It is very likely that, in the near future, a higher growth rate in price will be seen in dairy industry. This potential justifies considering investing in dairy industry, since the downward price risk is removed by price support policy in most developed countries. At the product level, cow milk dominates commercial production in global dairy industry (86.41%, FAO), while alternative sources of milk are also widely used especially in developing countries. In particular, sheep milk and goat milk together account for 2.19% of the total production (Table 1), and these alternative sources of milk is relatively less important for the developed economies (e.g. US and Canada) than for the developing economies (e.g. China). However, in terms of absolute level of production, the developed economies produce as many sheep milk as the developing economies do. Table 1. Production of milk from different sources (2006-2009 average). Among the alternative sources of milk, goat milk (0.78%) is the most important substitute for cow milk in the developed economies, but for the developing economies, the second highest dairy production goes to buffalo milk (Asian economies) or Camel milk (African economies). Moreover, the total production of goat milk is more than 20 times higher over that of sheep milk, though this ratio is much more unbalanced for the developing economies (34.4) than that for the developed economies (7.3). This dissimilarity of the structure of dairy industry is mainly due to the differences in local agricultural and cultural environments, but technological differences also reinforce this divergence. Detailed data on global dairy production are attached. To summarize the features of dairy market, developed economies (including US and Canada) have a very unbalanced production between cow milk and its alternatives, but a balanced production within the alternative sources of milk. In contrast, the dairy industry in developing economies (including China and India) is more balanced in the first aspect, but more unbalanced in the latter. The dairy industry provides various commodities, such as milk, milk powder, milk powder and cheese. There are also thousands of variants in each category. Though similar and related from the technical perspective, these products can well be distinguished from economic viewpoint, i.e., the price elasticity. The idea of elasticity is to describe the response of demand/supply in percentage to a change in price. If the elasticity is less than 1, the product is said to be inelastic, usually termed necessities. On the contrary, products with elasticity higher than 1 tend to be substituted more easily, thus facing higher market risk. It is not difficult to come with the proposition that dairy commodities are inelastic in demand, since they are usually regarded as necessities, especially in western world. 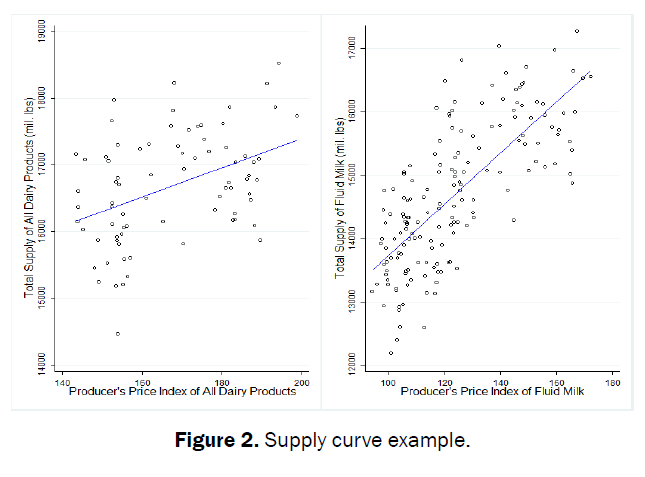 However, within the dairy industry, price elasticity differs across commodities. This distinction is very important to investors with lower risk profile. Table 2 shows the price elasticity for all dairy commodities and whole milk in particular. It is not surprising that the overall dairy commodity is quite inelastic, with median 0.42. The mean is a bit higher than 1, but it is not used because of its bias due to outliers. In contrast, for the specific commodity whole milk, demand is quite elastic (4.87) to price change. This results from the fact that there are numerous substitutes in market for whole milk, say, skimmed milk, semi-skimmed milk and soya milk, among many others. It is strongly advised to analyze each commodity separately to avoid unexpected loss due to price fluctuations. Table 2. Price elasticity example. Source: USDA National Agricultural Statistics Service, USA . As pointed out by Rabobank, margins had dried up for US producers by late 2010, as a full domestic market reduced milk prices. The high price elasticity of dairy suppliers (Table 3) makes the adjustment quick enough to reflect market changes. The dairy market has an elastic supply curve, as seen in the left quadrant of Figure 2. In particular, supply curve of fluid milk market (in the right quadrant) is even steeper, suggesting a more flexible production process. Table 3. Milk composition analysis (per 100 g). Figure 2: Supply curve example. The statistical relationship between producer’s price and quantity of production is informative to predict the change in the entire market in response to price changes. This forecast is important for adjusting marketing strategies in such a volatile market. It is advised to uncover the relationship for the products of interest separately. As the price fluctuates, market demand for dairy commodities goes up and down with certain regularity. As shown earlier, the overall dairy market is inelastic in demand, so there is little risk in sales if an investor holds a fair portfolio of dairy production. To capture the nonlinear feature seen in the demand-price scatter plot, cubic regression is used for the all-dairy-product case, and quadratic regression is employed for the fluid milk market. Obviously, demand curves are more complicated than supply curves in structure. The knowledge of this complication will enhance the investor’s ability to forecast the changes in market and adjust the production. 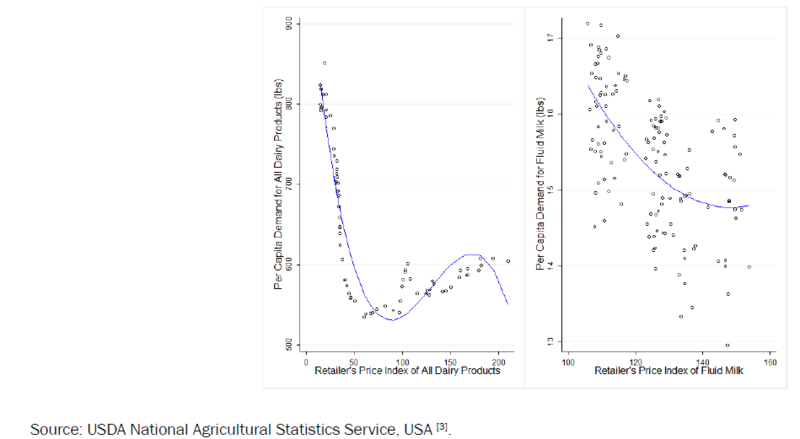 Hovhannisyan and Bozic  provide an empirical investigation of the relationship between grocery retail concentration and retail dairy product prices in the US. The estimated elasticity of demand is around 20%, which implies a very inelastic market response (Figure 3). Figure 3: Demand curve example. The following sections summarizes the “4 Ps” (product, price, promotion and place) of goat/sheep dairy products in North American market (US and Canada). In the North American market, there is a perception that sheep milk products are preferred by some particular ethnic communities, in particular the Spanish, Italian and Greek communities . To quote a Spanish proverb: “cheese from the ewe, milk from the goat, and butter from the cow”. Moreover, the goat/sheep dairy products are usually considered to belong to health food products (target market). Research shows that goat/sheep milk is highly nutritious, richer in vitamins A, B, and E, calcium, phosphorus, potassium, and magnesium than cow’s milk. It contains a higher proportion of short-chain and medium-chain, which have recognized health benefits (Table 3). Compared to cow milk products, goat/sheep milk is less allergenic, easier to digest, naturally homogenized, rarely causes lactose intolerance, and matches up to the human body better. Most of the goat/sheep milk produced in the world is made into cheese. Some of the most famous cheeses are made from sheep milk: Feta (Greece, Italy, and France), Ricotta and Pecorino Romano (Italy) and Roquefort (France). The US is a large importer of sheep milk cheeses. A popular US-based goat milk brand is Meyenberg (detailed below), which produces liquid milk, powdered milk, cheese, butter, chocolate fudge and even mask facial. A brief summary of the top brands in the global dairy market can be found in Appendix. While sheep usually produces less milk than goats and much less than cows, sheep milk sells for a significantly higher price per pound, almost four times the price of cow milk. Goat milk is more common than sheep milk in market, but it still sells at a significant higher price than cow milk. Apart from cost factors, the pricing of milk in the US involves a wide variety of pricing regulations based on public policy decisions. USDA’s Commodity Credit Corporation (CCC) stood ready to buy as much butter, nonfat dry milk, and cheddar cheese as manufacturers wanted to sell at specified support purchase prices. On the other hand, nongovernment pricing institutions are also important—the dairy cooperative being a major example. As the dairy industry has become less regulated in recent years, the use of futures markets has engendered considerable interest. Offers are used, including online coupons, membership gifts and seasonal sales. Since goat/sheep milk products are usually considered as health food, it has a higher price elasticity of demand, i.e., more like luxury goods than necessary goods. Periodic promotions will help widening its market share and increase the aggregate demand for goat/sheep milk. In addition to seasonal promotions from producers (wholesalers), the outlets (retailers) also give product-specific promotions to introduce these cow milk alternatives to the customers. In fact, the retailer’s promotion is more frequent than wholesaler’s, because the producer’s price can only change at each procurement, while retailer’s price can change every business day. The supply chain starts with local raw milk suppliers (usually via SAP system). There are approximately 100 dairy sheep farms in the US. They are found mostly in New England and the Upper Midwest. There are also several large commercial sheep dairies in New York and California. Most US and Canadian goat/milk products are sold only nationally or within the North American market. If international trade is involved, then the companies tend to design and manufacture the products in the local markets. The general managers of those companies in each local market (e.g. North America, Latin America, Greater China, South Asia and Europe) are in charge of negotiation with local retailers (e.g. supermarket, specialty stores, online market, etc. ), as illustrated in Figure 4. 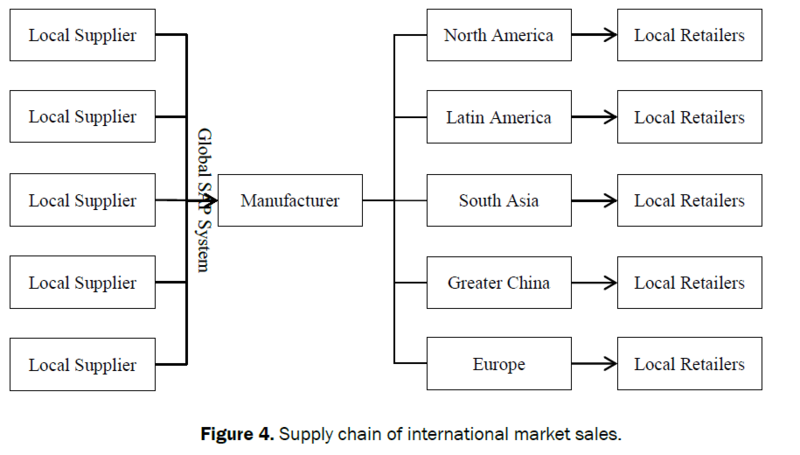 Figure 4: Supply chain of international market sales. • Supplier management for procurement of certain indirect goods and services categories. In addition to the SAP-based Electronic Data Interchange (EDI) option designed for large suppliers, most companies also provide alternative options for smaller suppliers, such as Supplier Portal Option and Email Option. It is now a common practice to use e Sourcing to facilitate national and international communications, online auction and collaborating on contracts. [RFI (request for information) is a proposal requested by a potential supplier to determine what products are potentially available in the marketplace to meet a buyer’s needs. RFP (request for proposal) is a proposal requested by a company interested in procurement of a product to potential suppliers. RFQ (request for quotation) is a standard business process to invite suppliers into a bidding process]. Usually, price is difficult to predict, but the consequences of price change are statistically tractable through elasticity and supply/demand curves. This information is essential for investors to prepare for unexpected changes in market. Low and controllable market risk is an advantage of investing in dairy industry. The dairy industry is also a promising opportunity to explore, given its potential in both developed and developing countries. China and India have huge potential for importing high quality dairy products, given the constant worry of domestic food safety. With the growing population of middle class, the future direction of dairy industry will be high quality dairy products. Surprisingly, the popular US cow milk brands (e.g. Mead Johnson, Abbott, Wyeth, Heinz, etc.) do not have any goat/sheep milk related products. The US goat/sheep milk brands are usually family-owned business specializing in goat/sheep milk products without doing cow milk products. In contrast, the Canadian goat/sheep brands usually produce all sorts of dairy products including goat/sheep milk products as one extra variety. The subsections below introduce four popular brands in North American market. They have different foci in product lines and targeting markets. Meyenberg’s liquid milk products are canned and have a 63-day shelf life, making it suitable for national and international market. However, due to the small business size, its targeting market is still limited within the North American. Its website (meyenberg.com) also provides recipes for different usages of its products, such as for the purposes of cooks, breeders and vets, kids and health & beauty. Its online information serves to “educate” its own consumers according to the “7 Cs” marketing theory. They operate their own farm to provide the raw goat milk from four types of herds: Alpine, LaManca, Nubian and Saanen, so their supply chain is shorter. In addition, Redwood Hill Farm also furnishes breeding stock to other breeders in the US, Canada and Mexico. Hewitt’s also produce cow milk and related products, with goat milk products as an extra variety in its product lines. Liberté sells in both Canada and the US using raw milk from local farms. Similar to Hewitt’s, goat milk is not their main product. Huang, et al. Marketing China's milk: A case study of the sales activity of dairy farmers in greater Beijing, China Economic Review. 2012;23:675-689. Rabobank’s Global Dairy Outlook. Rabobank Global Dairy Quarterly Q1 2016: Dairy Demand Fragile, but Growing. 2016. Hovhannisyan V and Bozic M. The effects of retail concentration on retail dairy product prices in the United States. J Dairy Sci. 2016;99:4928-4938. Burton MP and Bencini R. Consumer acceptance of new sheep milk cheeses. Australasian Agribusiness Review. 2005;13.